If you’re working with wediboard or your own handmade substrate (like the kind we used at Touchstone), you typically install the hanging hardware before you start and then just mosaic right over top of the fronts of the screws and washers. But what happens if you can’t / don’t install the hardware first? Well, you could take it to a framer and let him or her sort it all out, but what if you’re (a) cheap or (b) don’t want to frame the piece or (c) both? You can’t drill the screws and d-rings into the back of the mosaic, because it’s just foam covered in mesh and thinset – that would just be a disaster. This is the situation I found myself in with “Grounded” – there was a mix-up with the hanging hardware and we weren’t able to install it before getting down to business. So my mosaic has lived for months on a shelf, just waiting for me to find a solution. Thankfully, Pinterest came to the rescue. I saw a photo of a mirror (or maybe it was a clock?) hung using old belts and thought to myself, “Hmmmm, that might just work!” Now, belts were out of the question because, at 12” x 12”, I’d need one pretty long belt (in excess of 40”). So I decided on strips of leather. As luck would have it, R’s dad likes to work with leather, so I was able to snag some from him. Leather in hand, I only had 2 more hurdles: (1) How the heck to attach the leather to the mosaic and (2) how to attach the ends of the leather at the top so it could be hung on the wall. At first I thought I could tack the leather onto the sides of the mosaic with upholstery nails or something, but then I got worried that I’d either really crack the thinset on the edges trying to get the nails in, or the nails would slip right out of the substrate and the mosaic would plunge to its death. So my thoughts turned to glue. What the heck would bond leather to thinset? I did an unfair / inaccurate test with 5-minute epoxy, sticking a little piece of leather to a piece of plastic. Terrible results. The leather just kind of soaked up all the epoxy. It’s quite possible that the plastic threw off my results and that epoxy would have worked just fine, but I didn’t trust it. My next thought: Weldbond (hello, old friend!). This time I did a real test — leather to thinset — and within minutes the bond was forming and it seemed pretty strong. With the three sides glued, I just need to decide how I would join the two ends so that it could be hung. I was going to try sewing them together, but yah… my sewing skills are sub-par (and that’s putting it nicely). So instead I took it to a cobbler (do people still say cobbler?) and got him to put in a grommet, so I could just slip it over a nail. 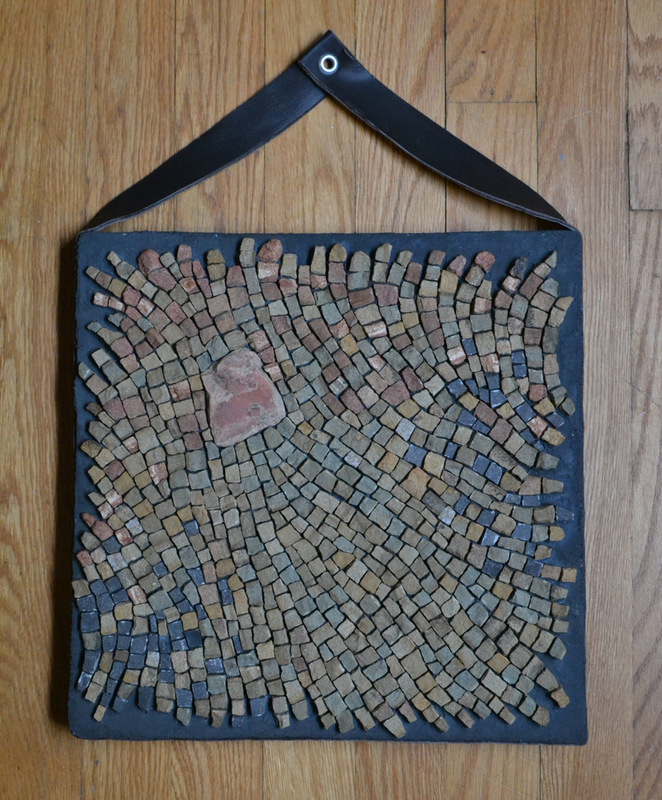 So two strips of leather, some glue, and a grommet later, my mosaic is now hanging (safely, fingers crossed) in my workspace where I can look up any time and see the mosaic that really got the ball rolling for me. 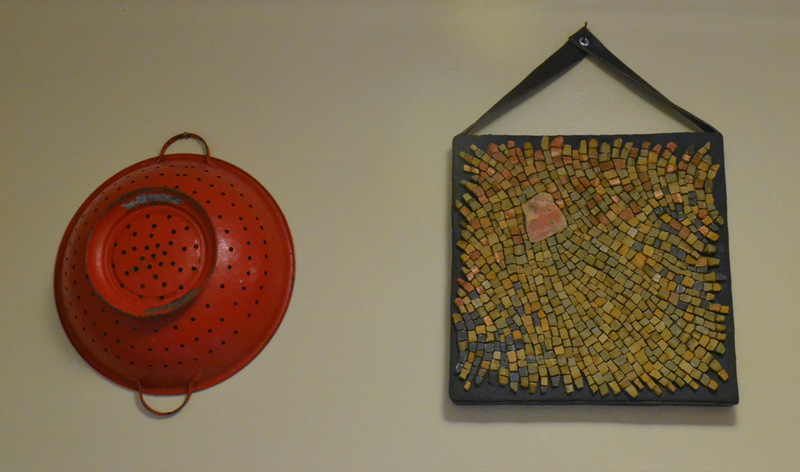 Looks perfect hanging next to my trusty red colander!